When you can see objects up close but cannot see them well far away, you may be diagnosed with myopia, or nearsightedness, a refractive error caused by having an elongated eyeball and overly curved cornea. If your eye is too long, the incoming light fails to reach the back of your eye (the retina). This interferes with the ability of the retina to focus the image, convert light into electrical signals and send these signals to the brain via the optical nerve. According to the Canadian Association of Optometrists, about 30 percent of the population of Canada is affected by myopia and must wear corrective eyewear to help them see distant objects clearly. Strong evidence exists that myopia is an inherited ocular disorder, meaning if one of your parents is nearsighted, you have a good chance of inheriting their myopia genes. Myopia normally starts developing during childhood and continues to increase until the individual reaches the age of 20. Although you may carry the myopia gene, it may never be triggered depending on your eye care practices. For example, if you spend a significant amount of time reading, staring at a computer screen or performing intensely visual work, you could strain your eyes enough to provoke worsening of an existing but negligible myopic condition. Another type of myopia caused by eye strain is called "pseudo-myopia", which involves overuse of the eye's lens, retina, and other focusing mechanisms. After extended periods of visual work, your eyes may be unable to focus on distant objects. Although normal vision typically returns after resting the eyes, consistently placing visual stress on your eyes could eventually lead to permanent nearsightedness. 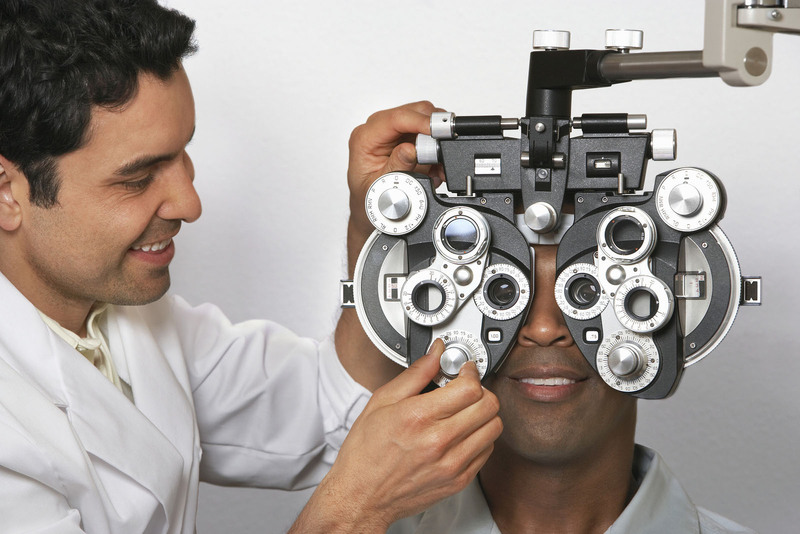 How is Nearsightedness Diagnosed and Treated by Optometrists? People with myopia will often have trouble reading road signs, a whiteboard in a classroom, the television set or other distant objects. Other signs and symptoms of myopia include squinting, eye strain and headaches. Feeling fatigued when driving or playing sports also can be a symptom of uncorrected nearsightedness. To diagnose myopia, our optometrists will conduct tests during a comprehensive eye health examination to determine if you are nearsighted. If your condition warrants it, your optometrist will prescribe corrective lenses for you. People diagnosed with myopia have several options regarding vision correction. These include glasses, contact lenses or even laser surgery. Depending on the degree of your myopia, you may need glasses or contact lenses for distance only or full time as the prescription increases to enable you to see more clearly. You also may only need them for certain activities, like watching television, going to a movie or driving a car. Contact lenses are very helpful for correcting nearsightedness and are ideal for people with more active lifestyles. They are available as disposable soft, daily wear, extended wear, and rigid gas permeable lenses. Call Your Maple Ridge Eye Doctors Today! If you decide you want to forego glasses or contacts and correct myopia with LASIK, your Maple Ridge eye doctors also offer preoperative and postoperative appointments for LASIK surgery care. Call Maple Ridge Eye Care today at 604-463-4469 to schedule an appointment for a vision exam or to learn more about glasses, contact lenses or LASIK surgery for treating myopia. We look forward to seeing you!